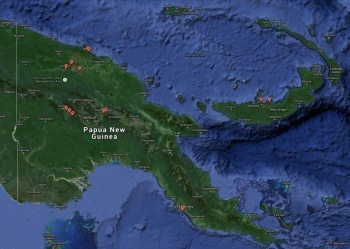 In August 2015 I visited Papua New Guinea (PNG). The trip was organized by Niugini Holidays, a tour operator in Australia. I had booked a private tour, since I don't like going on group tours. The organization of the trip was great, everything went smoothly. Only the pickup in Mt. Hagen airport by the hotel was a bit of a problem. I had to call them several times till they finally picked me up. I can really recommend Niugini Holidays. After over 50 hours in airplanes and airports, I finally arrived in Port Moresby at 5:00 in the morning. My guide was waiting for me and brought me to the Grand Papua Hotel in Port Moresby. After some sleep, I walked down to the beach. Nothing else was in the schedule for that day. I did not go out of the hotel at night, it is apparently not very safe in Port Moresby to go out at night. The next day I took a flight on a small turboprop plane to Wewak. The plane carried the casket of a local politician. This caused a huge traffic jam. My guide was about ½ hour late. I stayed in Wewak for one night in the Wewak Boutique Hotel. It was very nice, clean, good food, electricity, and cold beer. This was one of the best accommodations during the trip. The next morning my guide picked me up for the Sepik part of my PNG trip. We drove about 3 hours to Pagwi. From there we continued in a motorized dugout canoe for 1 ½ hours to Ambunti, where I stayed for two nights in a guest house. The boat ride was very scenic. They had put a wicker chair in the canoe for me. It was very nice, but a bit hard on my behind. The tour operator had suggested to bring an inflatable cushion for the boat rides. I had such a cushion with me, I just didn't pull it out of my luggage. I regretted that after while, but didn't really have access to the luggage at that point. I made sure to have the cushion out for the other boat rides, which made them very comfortable. The guest house in Ambunti was basic but very nice, with a shower and flushing toilet, and electricity in the afternoon/evening from a generator. This even meant that the beer was chilled. The next day was the Crocodile Festival in Ambunti. It was very impressive. The next night, the guest house was full with a total of nine people. They tried to put another person in my room, but I refused, I didn't want to share a room. It ended up OK, it was just a bit tedious to have to wait for the shower and bathroom with nine people sharing the facilities. After the second night in Ambunti, I was on the motorized dugout canoe again for 4 ½ hours downriver past Pagwi to Kamanimbit, this time with the inflatable cushion. In Pagwi we bought some beer for the next night, there was nothing like that in Kamanimbit. I would have to drink warm beer there. That happens frequently in countries like that, I am used to it. In Kamanimbit I stayed in a basic guest house. The house and sleeping room was OK. The toilet was a board with a hole in it over a pit. The shower was a bag with water, or at least was supposed to be, but the bag was empty. I didn't try to get water, I just waited for the next opportunity to have a shower. Cooking was done in the wooden house with a thatched roof. I was amazed that it didn't go up in flames, but I guess they have experience with that. It was quite smoky. They had just caught a crocodile and were butchering it in front of the guest house. That was part of dinner. It was very good. The next morning we walked through the village and visited the local Spirit House. The Spirit Houses are important for the local people, they are the centers of village life. Only men can enter the Spirit Houses. They usually contain beautifully painted and carved spiritual figures, drums, etc. They are used for rituals and initiations. The Spirit Houses are still important, even though the people are mostly catholic. The drums used to be used for communications. Some of the older people still seem to know about that. After the walk through the village we took the canoe back to Pagwi. On the way we visited two more villages with Spirit Houses, Kanganamun and Palimbe. In Kanganamun they performed a Spirit Dance for me, it was quite impressive. The next night I spent in Pagwi, waiting for the ride back to Wewak. In Wewak I stayed another night in the Wewak Boutique Hotel. The next morning I flew back to Port Moresby. In Port Moresby I visited an amusement park with zoo, to see birds-of-paradise and tree kangaroos. After a night in Port Moresby I flew to Tari. My new guide, Thomas, picked me up at the airport and we drove about one hour to the Lakwanda Lodge, where I stayed for four nights. The Lakwanda Lodge is basic, the rooms OK. The toilet is an outhouse, but with a flushing toilet. The water supply to the toilet was sporadic, so sometimes you had to flush with water from a bucket. The shower was in another separate hut. It also ran out of water once. The food was good. There was always lots of fruit with all meals. One evening we had a mumu feast. Altogether I was satisfied with the accommodations at the Lakwanda Lodge. On the first day in the Lakwanda Lodge we went bird watching, trying to see birds-of-paradise. I did see one of them. On the second day we walked around the village to visit a fortune teller and the skull cave. In the afternoon I hiked along the river for a couple of hours. Back at the lodge I saw a Huli dance performance. On the third day we visited the bachelor's village. This is where the grow the Huli Wigmen wigs. My guide described in detail how they grow the wigs. In the afternoon I saw a young girl's initiation dance. The next day I flew to Mt. Hagen to see the Mt. Hagen Singsing Festival. 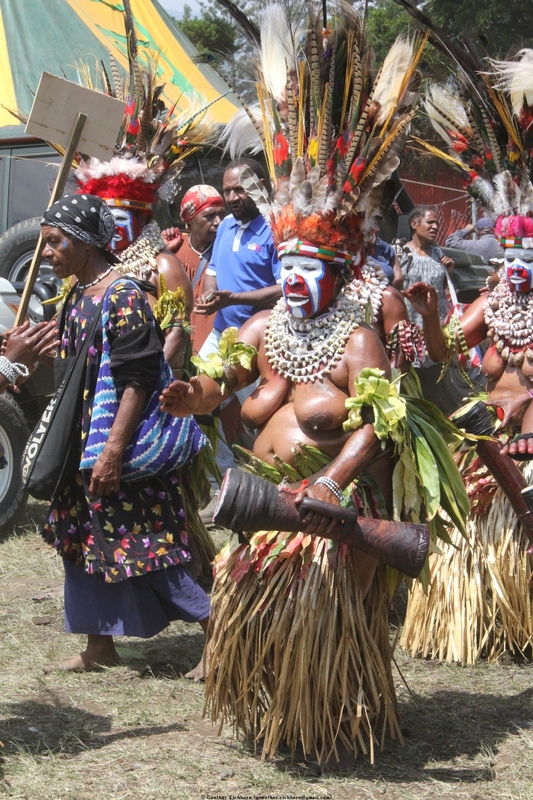 This is the second largest such festival in Papua New Guinea (after the Goroka festival). It is impressive to say the least. I stayed in Mt. Hagen for three nights and visited the festival for two days. There were about 90 Singsing groups at the festival, each group has between 10 and 30 participants. There were probably about 2000 participants at the festival. After the Mt. Hagen Singsing Festival I flew to Hoskins on New Britain, with a stop in Port Moresby. I was surprised when a representative from Niugini Holidays was at the airport to help me with the transfer to the next flight. I had four hours in Port Moresby, so my guide helped me to find some post cards. Up to that point I had not been able to find post cards, even at the festival in Mt. Hagen. Even in Port Moresby it was almost impossible to find cards. I found some that were quite plain, not very representative of PNG. PNG is not set up for tourism very well. I stayed at the Walindi Plantation Resort on New Britain for three days. I did a lot of bird watching during that time. This is where I saw most of the wildlife during my trip. After three nights in New Britain I flew back to Port Moresby. I had the morning there to do sightseeing. I visited a local fishing village, the Hanuabada Stilt village, and the Parliament. Around noon I checked in for my return flight to the USA. The hotels in Port Moresby and Wewak were very nice. The hotel in Mt. Hagen was adequate. The lodges and guest houses were from simple to very basic. Only the lodge on Great Britain was very nice, as good as a good hotel. Overall, I was happy with the accommodations, I have no problem staying in basic accommodations in such countries. Food was usually good, even in the simple guest houses. Beer was available in most places, at one guest house I had to take beer with me. Electricity was not available everywhere, so sometimes the beer was warm. Everything is very expensive in PNG. For instance in the Grand Papua Hotel in Port Moresby, the dinner buffet was $45, and a beer was $5. The Wewak Boutique Hotel had prices almost as high. Even in the lodges, the beer was between $3 and $4.50. PNG is a very expensive country for tourists. And it is not very well set up for tourists. But it is well worth a visit. There is a lot of the old tribal culture still alive. It is fascinating to see for instance the festivals. Seeing the Huli Wigmen and their culture was fascinating. Seeing wildlife is not easy, you don't see much on regular tours. You would need to organize a special wildlife tour. The exception was New Britain, where I had specifically asked for a bird watching tour. It definitely was worth the visit, even though it was very expensive.